Beef Tripe. It seems to be all the rage with dogs these days. I keep hearing how much dogs love the stuff. I didn't know much about beef tripe except for that it is super stinky, it's made from stomach, and dogs love it. That's about it. So, when I had the chance to try some dried beef tripe with my dog, I decided to give it a go. "Beef tripe is usually made from only the first three chambers of a cow's stomach: the rumen (blanket/flat/smooth tripe), the reticulum (honeycomb and pocket tripe), and the omasum (book/bible/leaf tripe). Abomasum (reed) tripe is seen much less frequently, owing to its glandular tissue content." So, beef tripe is a cow's stomach basically. According to our package of Evanger's Beef Tripe, you can feed the pieces of tripe as they are (dried up and crunchy) or you can rehydrate the in a bit of water and top your dog's regular food off with them. So far, Shiner has only eaten the crunchy version. I was expecting some major stinkiness with these dog treats, and so I sniffed the container with caution. To my surprise, the dried beef tripe was not stinky. It does smell just a little, but I was expecting to be knocked off my feet or something crazy. This dried beef tripe does look nasty though you guys... of course, anything that looks that gross you know the dog is going to love. So, what does Shiner think of her Evanger's Dried Beef Tripe from Chewy.com? She loves it! The price of this dog treat at Chewy.com is very affordable. And if Beef Tripe isn't for you, they've got just about any other kind of dog treat or food you can imagine over there. Chewy.com strives to bring their customers excellent customer service. Our package was delivered fast. Shiner is quite impressed! 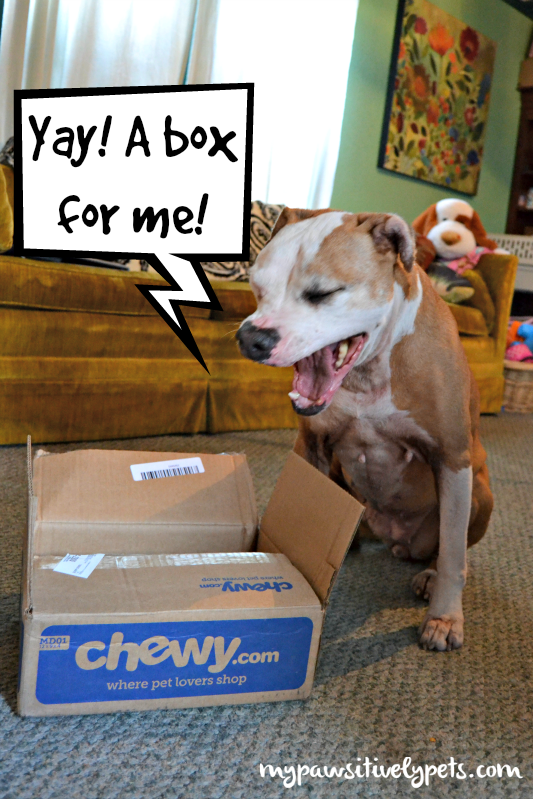 Also in our Chewy.com box was a fun dog toy for Shiner made by KONG. She loves this thing, and it seems to be lasting her longer than most plush type dog toys. You can see more about Shiner and her new toy in the video below. 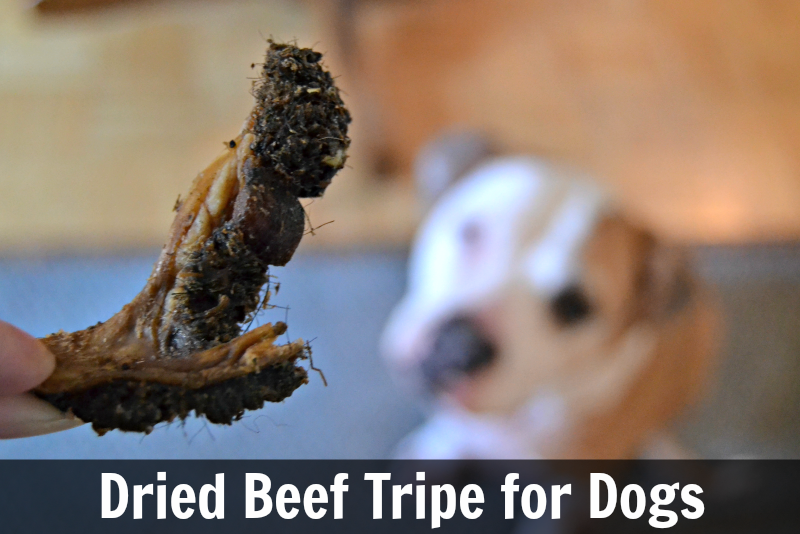 Has your dog or cat ever tried beef tripe? What did they think? We received free products from Chewy.com. Pawsitively Pets only shares information we feel is relevant to our readers. All opinions expressed here are our own and truthful! my mom said ewwww as she saw this treat... but I say YAY that looks delicious! and I bet the smell is great too, right? enjoy it Shiner, that are treats just for dogs (not for mom's). My dog's have never had Tripe but I bet they would like it! Sometimes I get pretty grossed out when I realize what they are really eating! Chewy gave us a beef trachea the other day but my little Starla loved it! Oh now beef trachea, Shiner has had before. She likes it too! Oh I love tripe, Miss Ann! 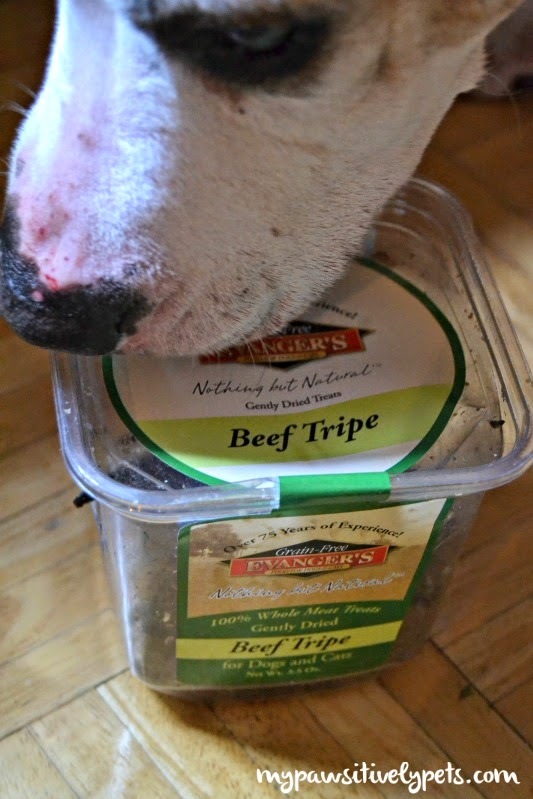 Did you know that raw green tripe is really good for dogs with upset tummies? The raw tripe still has the cow's stomach acids in it and that helps dogs with digestion! I am SO glad Shiner enjoyed her Beef Tripe by Evanger's. And oh...what a cute toy! How interesting Oz, I did not know that. I can imagine that raw tripe would be much stinkier... I could go into details but I'm sure I'd gross someone out with my vet tech stuff LOL. Dang, you sure did enjoy that yummy stuff sweet Shiner! Haha! I don't blame you. Shiner has not tried any alligator... yet. Our absolute favourite but peeps says they stink to high heaven so we only get them occasionally. Have a marvellous Monday. We've been eating tripe for years. It has been common in Europe like forever, and we missed it when we moved to the US. Now we are happy to be finding it more and more here and the price is getting better too. Grr! I wish Chewy shipped to Canada. I wouldn't mind having these snacks in the house, Bain loves tripe. We had to MOL at your description: nasty = dog LOVES it! MOL! M refuses to buy it for me because something about when she was a little girl, her mother tried to get her to eat Tripe! EWWWWWWWW and she hasn't touched it since. Now keep in mind M is old and grew up in the stone age. They used to eat all kinds of gross things back then. Never saw a dehydrated one. Our dogs had canned and raw. Love it. Morris, our Bernese suffered badly with tummy upsets as a young dog. Someone recommended raw tripe and he loved it. He never had another upset tummy in his life. We used to bulk buy raw blocks of the stuff and freeze it. My mom has no sense of smell and never realised how much it stank! Don't they? BOL... Hope they enjoy - I am sure they will! 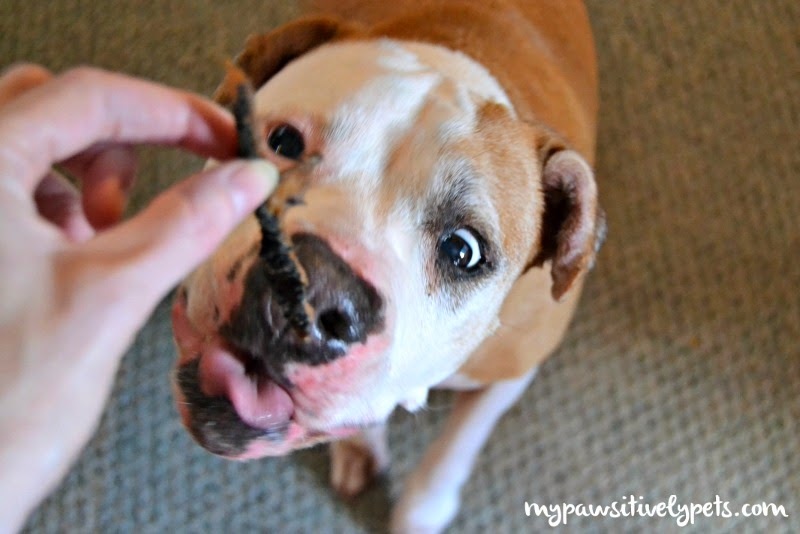 My dogs love raw tripe and tripe treats! My dog LOVES raw tripe. I think it's weird. - Crepes.